Continuous software development is an umbrella term that describes several aspects of iterative software application development, including continuous integration, continuous delivery, continuous testing and continuous deployment. Continuous integration refers specifically to the process of steadily adding new code commits to source code, a concept that has evolved over the years. Originally, a daily build was the standard for continuous integration. Today, the usual rule is for each team member to submit work as soon as it is finished and for a build to be conducted with each significant change. Usually, a certain baseline of automated unit and integration testing is performed to ensure that new code does not break the build. This way developers know as soon as they're done if their code will meet minimum standards and they can fix problems while the code is still fresh in their minds. An important advantage of continuous integration is that it provides developers with immediate feedback and status updates for the software they are working on. Continuous delivery builds on continuous integration and as with continuous integration, each code commit is automatically tested at the time it is added. In addition to the automated unit and integration testing, a continuous delivery system will include functional tests, regression tests and possibly other tests, such as pre-generated acceptance tests. After passing the automated tests, the code changes are sent to a staging environment for deployment. 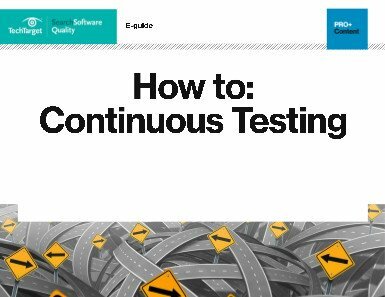 Continuous testing adds manual testing to the continuous delivery model. With continuous testing, the test group will constantly test the most up-to-date version of available code. Continuous testing generally adds manual exploratory tests and user acceptance testing. This approach to testing is different from traditional testing because the software under test is expected to change over time, independent of a defined test-release schedule. Continuous deployment adds more automation to the process to the software development process. After passing all the automated delivery tests, each code commit is deployed into production as soon as it is available. Because changes are delivered to end-users quickly and without human intervention, continuous deployment can be seen as risky. It requires a high degree of confidence both in the existing application infrastructure and in the development team. Continuous deployment is frequently seen in consumer-facing Web and mobile applications that frequently push updates to their customers as a part of the value that they bring. Ah this has been controversial in our circles. So some of us may find the terms confusing with how they are defined. Hi Veretax! It´s a good point of view, Thank you!